THE IDIOTS' BOARD: PNOY WITH BARACK & ON GAY MARRIAGE! 1. 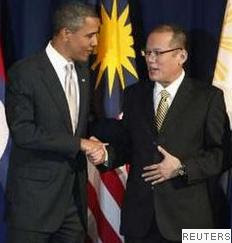 US President Barack Obama congratulated President Aquino for the reforms he has set in motion in the Philippines. To mention the US chief congratulated the Filipino head for its achievements - having dated several women in less than one year. Bravo! 2. In New York during the launch of Open Governance Partnership (OGP), the two heads of the state had a chance to discuss the new partnership aiming to promote transparency and accountability in government service and most of all in claiming and ownership of the islands in West Philippine sea. 3. The Philippine President invited the US chief of staff to visit Manila, but the latter made no commitment. He still can't get over with the Manila bus hostage tragedy. He's still in doubt with the security. 4. During the OGP forum, Aquino presented the road map which is a formulated action plan to fight against corruption to be unveiled in January 2012. As expected its always intended for the former first couple. How about the likes of JP Enrile and the rest of the Trapo's? 5. An advocate of good governance that underscores anti-corruption agenda for countries, the OGP is a new multilateral initiative to promote transparency, empower citizens, fight corruption and harness new technologies to strengthen governance. This is for you GMA. 6. Aquino enumerated several programs that his government undertook to keep the citizens informed, among them a website where people can report public officials’ misuse of funds, a Palace portal and another one that details government allocations. And a portal for the President's love life updates. 7. Aquino is open to the idea of gay marriage in the country. No Asian country has legalize the said union yet. But, proposals have been made in Nepal and Taiwan. Philippines is on the verge of going on top Asia-wide on getting the first slot to legalize gay marriage. Baguio city is its capital. 8. Despite his openness to gay marriage idea, Aquino is in dilemma concerning child adoption by gay couples. This is the most of Aquino's moral perception, he is looking forward to prevent child molestation and abuse in the future.